An amazing woman recently passed away. She was not only a caring wife, mother, neighbor…she was, by all accounts, an exceptional grandmother. And although I know that she is now without pain, and no longer trapped by a crippled body, my heart aches for those left behind. Her passing hit close to home for me; not only because she was a neighbor, but my own grandmother passed away Aug. 11, just a short three years ago. I still miss her so much, and I still catch myself dialing her number when something is going on and I need to talk to her. Valerie Lynn Brandenburger and Vivian Lorraine Brandenburger – peas in a pod. And so, today, I’m writing a list of things that only Grandmothers know how to do…at least mine, anyway. 1) Grandmas know how to make the world go away. It may take a homemade cookie, a walk in the garden or a “job” that needs to be completed. (Sweeping out gutters, anyone?) She knows that sometimes we just need a mundane task to work out our aggressions, or a simple snack to give us a second to think. Somehow she just knows. 2) Grandmas know how to keep secrets. Whether it’s a cookie too close to meal time, staying up too late, or the name of a crush that’s been on your mind…when you tell Grandma not to tell anyone, you know her lips are sealed. 3) Grandmas make special moments even more amazing. Going shopping? Take Grandma with, and it’s always good for a few amazing memories. Especially if your Grandma is anything like mine. She loved clothes. LOVED. In fact, for her 80th birthday she wanted a pair of leather pants. It was my mission to find some for her, and to this day, one of my favorite pictures of her is her standing in her yard, all decked out and ready to rock bingo. That lady had an amazing sense of fashion. 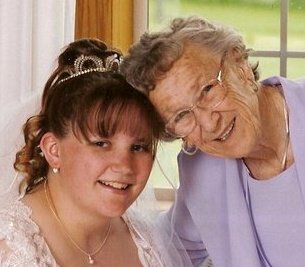 5) There isn’t a problem in the world that doesn’t seem less daunting when you’re holding Grandma’s hand. Whether it is crossing the street for the first time, healing your first broken heart or saying good-bye…there is powerful medicine in those fingers. It’s the one thing that I miss the most. This entry was posted in About me and tagged family, grandmothers, grieving, love by wagfarms. Bookmark the permalink. Another really great post! This brought tears to my eyes because it made me think of my Grandma. She’s been gone for nearly 18 years and I still miss her like crazy! She was so much more than just a Grandma. And…I’m a Grandma now. Hard to believe those years are here already. I hope and pray that I will/can be half the person she was to me to my grandchildren!! Grandparents are truly a gift from God! What a beautiful post! I am sure your grandmother was so proud of you…it’s a special bond and you captured it perfectly! So sorry for you loss! She was an amazing woman…and I was fortunate to have her! Amazing post! My granny just passed away last week & this almost describes her to a T (well except the leather part lol). Thanks so much for making me remember all the wonderful things she did for me as a child! This is a tribute to all Grandmothers, whose wisdom, courage and love have paved the path for future generations – we thank you! A Grandmother is someone with silver in her hair and gold in her heart. Grandmother -grandchild relationships are simple. Grandmas are short on criticism and long on love. — Author Unknown A grandmother is a little bit parent, a little bit teacher, and a little bit best friend. — Author Unknown A Grandmother is someone who educates the heart of all her grandchildren. Remember your Grandmother as old age starts to take its toll mentally and physically. It is your turn to care for her. Tell her something funny that happened at school or a fun thing your pet did. It is your turn to “talk story” with your Grandma.